Anyone know what kind of material was used in making the bumpers on the 26-27 Improved cars? I just had a set of twin bar front bumpers re-plated with nickel and the guys at the shop said it was the toughest stuff they have ever had to try and clean up. The bumper bars were pitted and pretty ugly from years of use (or abuse), a couple of bad paint jobs, and it looked like years of accumulated scale. The shop guys said they went through a huge stack of sanding belts trying to clean up the surface enough to give a good finish. The end product looked great though. Since it seems those bumpers are pretty tough to find at a decent price, I was going to commission a friend of mine who is a blacksmith to make me up a set and then I will do the prep work and send them out for plating. But first, I need to know what kind of material they were made from. I'm no metalurgist, so I have no clue what the things were originally manufactured from. If you're not going to use the bumpers to bump into things, then I think regular construction steel would work for repro bumpers. By the way, aren't some repro bumpers made out of stainless steel? More expensive and harder to work with, but you don't have to plate them after polishing. I don't want stainless steel as they would look a little odd when paired with the freshly nickel plated ones up front. That's why I am trying to figure out what material the fronts were constructed of so they can be duplicated. If I had the time, I would head to Chickasha. Unfortunately, time is at a premium this spring. Bumpers were made from spring steel on cars up until the shapes of them got too complicated to shape out of that hard material. For example, the bumpers on a '38 Chevy I owned 20+ years ago were definitely spring steel, while the bumpers on my '53 Dodge is regular steel about 1/10" think since it's shaped in a press, not just edge cut and rolled in the ends like on 20's-'30's cars. Model T bumpers weren't rolled in the ends = easier to duplicate. Some plating shops can fill the pits in your originals with copper. Making all new ones shouldn't be needed. Weld a screw to the rear where the clamps go to suspend them in the bath - can be ground off afterwards. Kevin - You should be able to find original bumpers to replate. 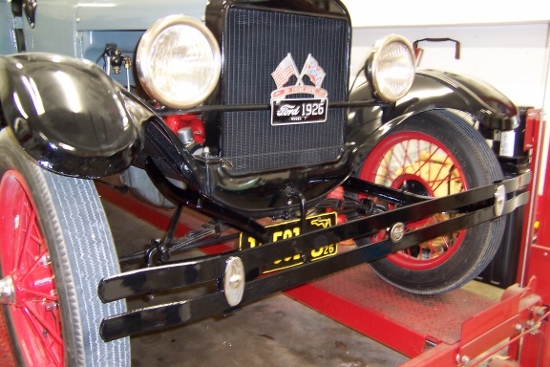 Try Mike Peterson in Shevlin who often parts out Model T's and advertises on Ebay and sometimes posts on this Forum. You might also check with Model T Haven in Iola, Kansas where they have a whole yard full of Model T parts cars. Of course, you could put a wanted ad on our MTFCA Classified section. According to Colvin and Stanley, "American Machinists Handbook" it was Ford type S carbon spring steel. Not sure about T bumpers but A bumpers were mill finish on the back. I would imagine that the T's were the same. Bought this pair of front bumper bars for $10. Then to the powder coater for sandblast and black shiny coat. $30. In the sixties, in college, I made a pair in an Industrial Arts class that I was taking. I just used regular steel of the proper thickness, width, and length and rounded the ends and put the bends in the right places. My theory was that I was just making them for looks. They were going on my Grandfather's 27 coupe and I knew my Dad or I were going to drive it safely. In the day, bumpers were on a car to provide some degree of protection, but now days, they are on a car for looks. Look at how many 26-27's don't have bumpers, and pre 26's only had bumpers back in the day if they were accessory bumpers. The bumpers I made lasted 50 years and are still in my garage. I'd agree that if you are going to go new, there is no need to go spring steel just for the sake of having spring steel. They won't bend unless someone wants them to bend, they will buff out gorgeous with 1/2 the work, and while the big known fact about electro-plating is prep prep prep...the process bath itself LIKES softer materials. Spring steel I think would need to be etched or reverse current shocked before plating is done if you don't want any chance for it to bubble or flake later. Low carbon steel just has a lot of natural bite when it comes to wanting to accept a plate coat. Originally, the bumper bars were only polished on the face, the edges and backs were "mill finished." Most original bumpers nowadays are too pitted to not do some cleaning work on the edges and face. However, if you can get a plater to work with you, after a heavy copper plate, and the front of the bumper is nearly finish polished, take the bumpers, protect the face and shell blast the back and edges lightly. Then have the plater finish the front polishing & plate. The edges and back will then have a dull somewhat "rough" finish that will approximate the original. As for not using spring steel, well, YOU may be driving your T safely, but the other drive may NOT be driving his/her car safely. I want that spring steel protection for my car--and especially for the radiator! David, I agree on the protection issue. My originals that I just got re-plated are going on the front. Any re-pops or replacements are going on the rear. Most Model T folks are very safe drivers, but I have seen a couple of occasions where in the line-up before the tour, where someone innocently presses the wrong pedal and BAM! As scarce and expensive as good rear fenders are for the Improved Car Sedan and Touring, I want as much protection as I can get from my bumpers. Dan T are the bumper brackets on your car shop made or did they come off another car. When I was building my Kamper I had to make the front seat backs which consisted of a padded backing supported by a spring steel post. This was to give movement when moving so the back adjusted to the persons body and also to allow it to be pulled out so the seat became part of the bed. The seats are extremely comfortable. When getting the springs reset I mentioned this to the foundry setting the springs, the owner gave me new steel and told me to cold bend the shape of the posts and drill any holes that needed to be added. I was surprised at how soft the metal was, it was easy to bent the 2" by 1/4" flat bar by hand and drilling holes was like drilling wood. After they were tempered they became as good as any steel spring leaf.